His work is deliciously creepy. It reminded of a lot of the work I used to read in Raw and Weirdo--the two classic art comics anthologies of the 80s (edited by Art Spiegelman and Robert Crumb respectively). I can see touches of Kaz, Gary Panter, Marc Caro, Brad Johnson, Julie Doucet, etc., in his art. I'm referring to his drawing style, of course, but even moreso to the sheer unsettling strangeness of his work. You read it and it makes sense and even in some ways feels "realistic"--but in each story there is an overarching (or underlying) alien quality. For example, in Lose no. 3 (Koyama Press, 2011), he has a story called "Dog 2070." It's the story of Stephen, a very self-centered divorced guy. But he's a dog, a dog in a future world where dogs have pretty human lives. OK, so far not too strange. After all, there have been animal characters acting like humans in comics since the earliest comic strips, and the tradition of human-acting animals goes back to at least the ancient Greeks. His drawing is not highly realistic, but it contains a lot of detail and a lot of marks. I use the word "marks" as distinguished from "lines". This is a distinction that I first heard expressed by Gary Panter. Panter seemed to see lines as descriptive. Marks at best added texture, but they could also be seen as bits of ink that sat on the surface, that help you remember you are looking at a flat piece of paper with ink printed on it. The dogs are not merely anthropomorphized animals. Instead, they seem to have a science fiction quality. For one thing, they have flaps of skin that allow them to glide (not too well, but still). Stephen, who hasn't glided in years, impulsively tries it at the wrong time of year and badly injures himself. The point is, they seem designed. Keep that in mind. 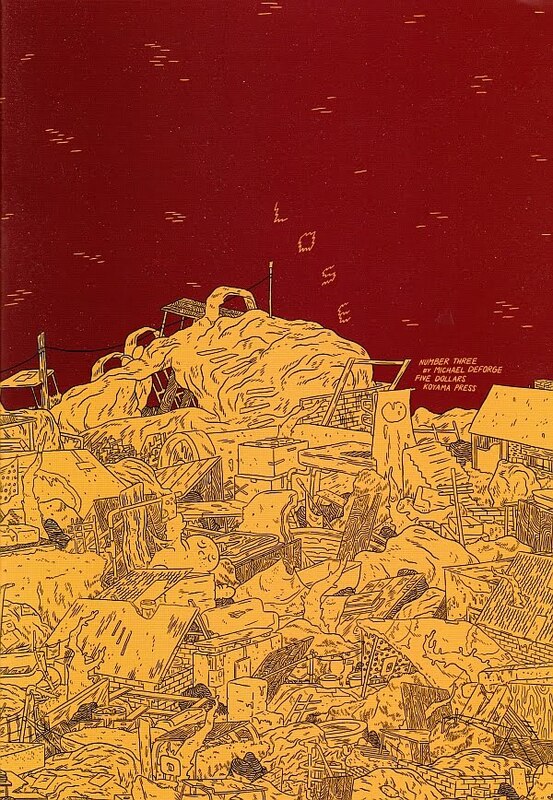 They live in a world a lot like ours, except when DeForge draws it, it looks like a ruined wreck that has been partially rebuilt. This makes me think of two post-apocalyptic novels, Oryx and Crake and The Book of Dave. In both, a calamity has left a future inhabited by genetically created creatures with some level of intelligence. That's what these dogs seem like--replacements for humans. And they believe themselves to be humans, living lives similar to how we lived in the early 2000s. Stephen is a massively self-absorbed office drone in this strange (but familiar) new world. This gives hints of why he is divorced. He has a vague obsession with his ex-wife, and a strong desire to connect with his two boys. But the desire is not strong enough that he is willing to become famiar with their world, which leads to scenes of awkward generational misunderstanding. All the events (except for the gliding) feel like the kind of thing you could see depicted in a modern realistic novel, say one by Jonathan Franzen. It's painful to read because it rings very true. And yet, you can never forget the weird mark-making of DeForge's pen or the strange mutant setting. The final scene hammers this home--Stephen dreams that he, his ex-wife and two boys are on all fours for some reason, struggling over a piece of meat (like real dogs do). He doesn't understand what he is seeing and it disturbs him--and us. 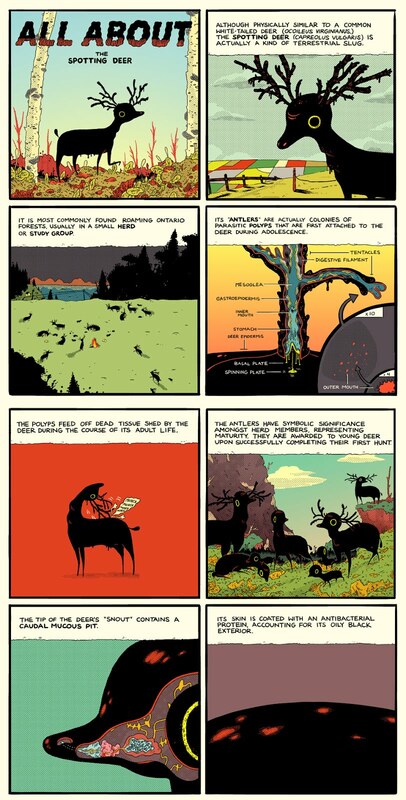 DeForge takes various tropes and genre cliches and smashes them together to create a work of unsettling dislocation. "All About the Spotting Deer," which was published online at What Things Are and as a small comic from Koyama Press, takes as its base structure the high school science report. 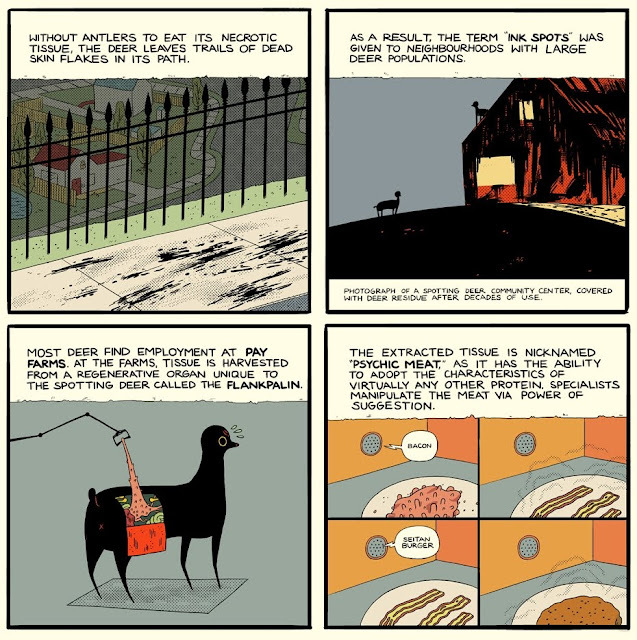 It talks about this strange creature (which appeared in "Dog 2070" as a mode of transportation)--it's diet, its mating habits, its habitation, its interactions with people and civilization, etc. 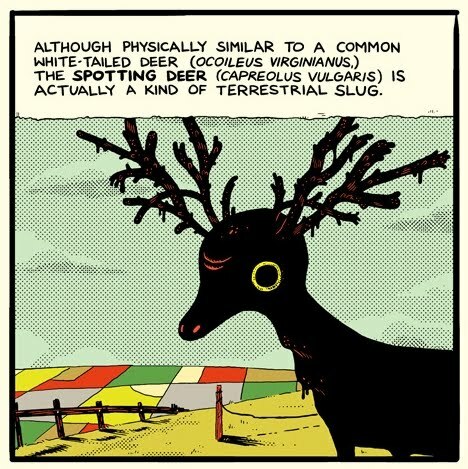 The Spotted Deer has the appearance of a perfect cartoon animal--maybe one from an obscure 1920s animated cartoon. But the essay provides careful scientific-sounding explanations for all its cartoonish features. I get the impression that these is more to DeForge's work than I can see from the stories I've read. He may be creating a "world" in the same way that Jaime Hernandez or Jim Woodring did. This could be risky, especially if the world he creates explains everything--and therefore removes the strangeness. 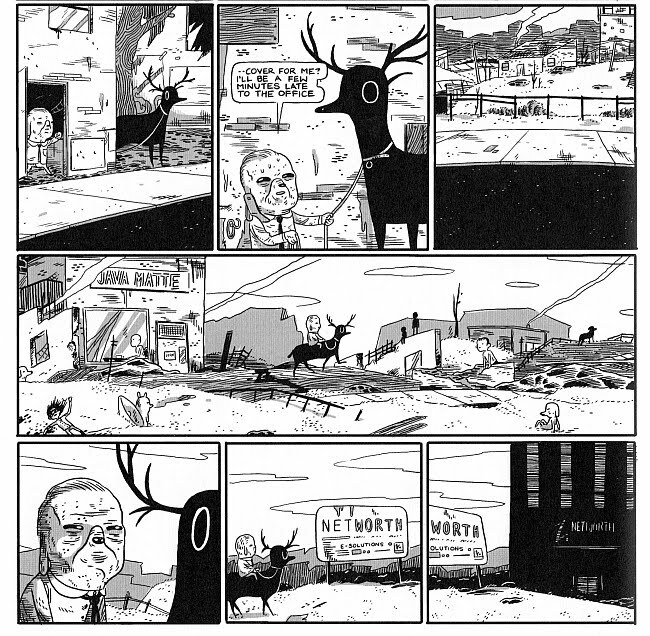 But ideally, such a world--if it actually exists and is implied in DeForge's work--would aggregate the strangeness. From what I've seen so far, it has the potential to be an unusually rich creation. One final note--Koyama Press is a relatively new publisher, specializing in art books and comics. 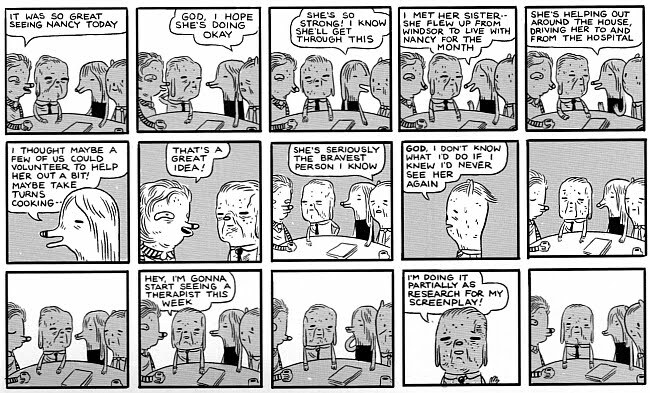 When you think of the great alternative comics publishers--Fantagraphics and Drawn and Quarterly--they started off with a small stable of artists and nurtured them for a long time (the Hernandez Brothers, Chester Brown, Seth, etc.). 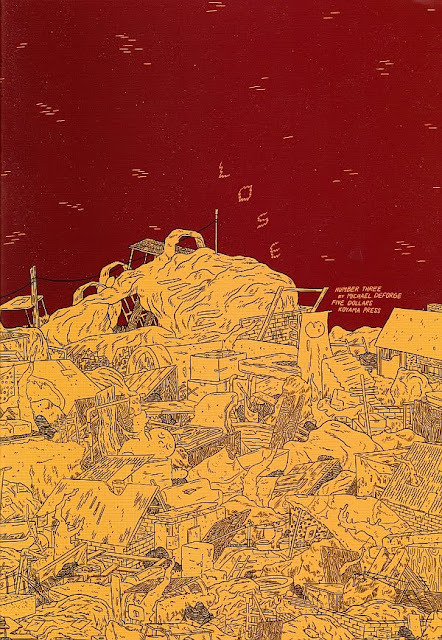 I hope Koyama Press will form a similar relationship with DeForge. Art comics artists need good publishers as partners.